Coco-Bliss Coconut shell charcoal are available in 24 pieces coals, 60 coals & 120 coals box packing. 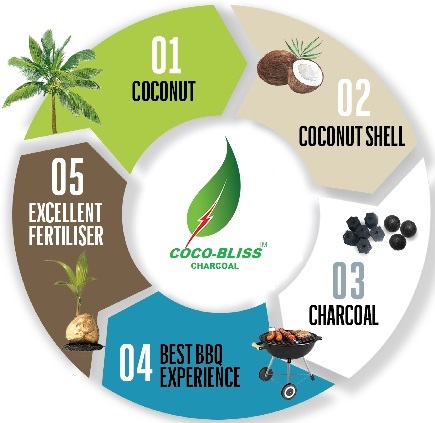 Launches 'Coco-Bliss 'A Certified Organic 100% Coconut Shell Charcoal that burns more than an hour with 7000 calory / gm heat without oil content and that leaves less than 5% ash. 'Coco-Bliss' charcoal is organically made from 100% natural and the finest quality compressed coconut husks / shells following the highest quality level. 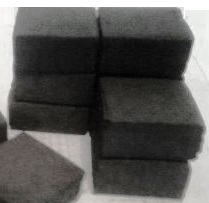 The dimensions of the Coco-Bliss briquette has been tactically kept rectanglular instead of cube that sits more accurately on tobacco bowls while smoking i.e. 25 x 25 x 16 mm. Coco-Bliss burns hotter and much longer than most other natural coals. Coco-Bliss is the preference for most hookah connoisseurs, because they are clean-tasting and help create a smooth hookah smoking experience. Like many other natural coals, a stove or torch is necessary to lite. 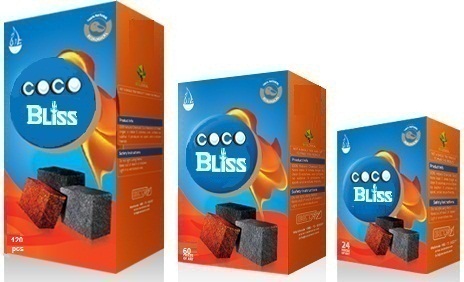 Coco-Bliss charcoal has been introduced in the market at an economical price without compromising the quality. 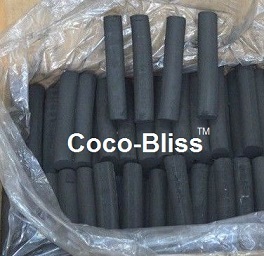 If you are a wholesale distributor and are looking for a premium quality coconut shell charcoal then Coco-Bliss is the right choice. We proudly say that "Coco-Bliss Coconut Shell charcoal is the finest coconut charcoal available in the market"
In Middle East region, this shape is favorable because the cylindrical shape has more surface so it will transfer more heat to tobacco. For finger shape, there are breaking length on every 25 mm. This will make the consumer to easily break it accordingly. Cube shape is popular in North America because it needs only 5-7 minutes to ignite over the gas stove or electric coil stove. But it will last almost 70 minutes for hookah smoking session, with only 3 pieces of this charcoal shape needed. * All prices are excluding packaging and pallets. Please contact us to calculate detailed additional cost for packaging and pallets. * Minimum order quantity for buyer's private brand and label (OEM) is 9,000 kg / 20 feet container. * Commercial sample is available for free of charge, but buyer should pay the shipping cost. * T/T: 50% downpayment and 50% against fax copy of Bill of Lading (B/L). Original B/L will be sent once balance payment is cleared. We prefer this method. * For private brand and label, all packaging costs should be paid in advance.